Without a doubt, Dec. 25 is truly prime-time for the NBA. With a slew of high profile match-ups during Christmas Day, ESPN has created a series of humourous spots with a few of their star players having a conversation with Santa Claus about the upcoming match ups. As part of a campaign that have begun airing on ESPN's various TV and digital platforms, comic actor Jon Glaser dresses up as St. Nick for a series of spots featuring NBA stars Ben Simmons, J.R. Smith, John Wall, Nick "Swaggy P" Young and Bradley Beal. 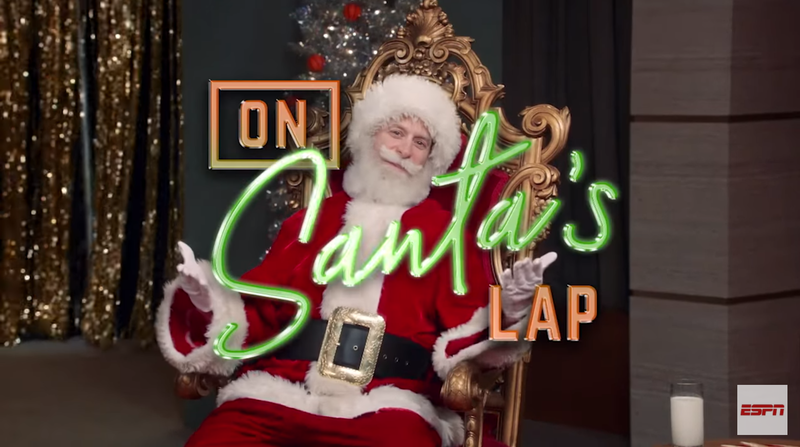 Among the more effective promos are the one that demonstrates the Washington Wizards star point guard, John Wall, showing off his impressive cookie-snatching quickness and Golden Stater Young's request to Glaser Claus to "take me to' space."